Not to be outdone by its peers, Google announced a series of product updates to its social network on Monday morning, catching up to a recent slew of social network makeovers. Most of the updates are minor tweaks, aimed at refining the company’s product in response to user feedback — and also after eyeing development at Facebook and Twitter, no doubt. 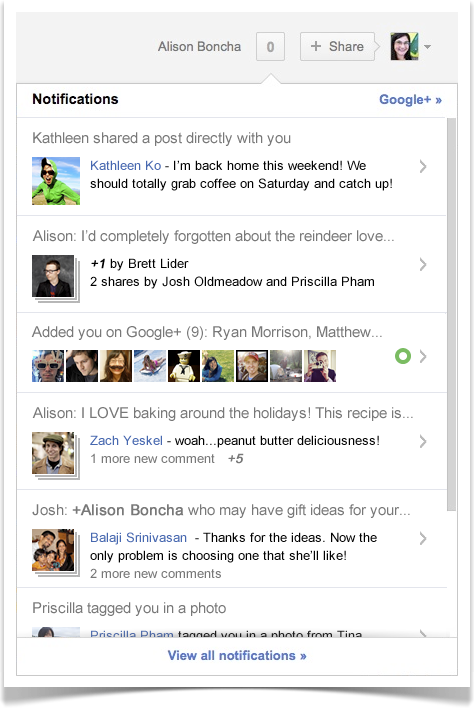 Do you have a few Google+ friends who are obnoxiously prolific in their status updates? The new “graphic equalizer” essentially sticks a volume knob on every user, allowing you to adjust your exposure to annoying updates accordingly. So, if you’d rather not read up-to-the-minute coverage of your pal’s sick kitty, slide the equalizer button to the left and watch the offending updates dwindle (or disappear completely, if you’re really that tired of them). Taking a cue from Facebook’s highly developed photo sharing system, Google revamped the photo viewing features of Google+. In the new version, the lightbox viewing environment gets a significant overhaul, allowing users to view pictures in full-screen mode, while one-by-one comments slowly populate the periphery. Photo tagging is also now easier, and the traditional comment sidebar (the one that appears when not in full-screen lightbox mode) is now backlit with white, making it easier to read what friends have written. Finally, Google gives users a host of simple photo editing tools, so cropping, adding text, and overlaying goofy graphics (like antlers or santa hats) is fairly simple. Similarly, Twitter reworked its own user interface in a recent unveiling. Twitter’s goal? To reduce confusion around some of its more heady product features (just try explaining what a hashtag is to your grandma, and you’ll know what the company is looking to address). At first glance, Google’s most recent tweaks seem somewhat minor compared to other social media overhauls. But do consider that Google+ launched only six months ago, and it’s still the new kid on the block within the larger social media sphere. The Google+ team is still feeling its way around what users want from the service, and how to slowly build improvements that aren't jarring. In some respects, it could even be an advantage to hit the social game as late as Google has. The company has watched Facebook make a series of gaffes over the course of its development, as various updates have been met with extreme user backlash and privacy concerns. From Google’s perspective, incremental changes — deliberately doled out in response to user feedback — could serve to avoid unfortunate missteps. Google is also trying to ramp up its appeal to the business crowd, offering a number of tweaks that make it easier for brands to manage their online expressions. In a perk for larger organizations, businesses can now add multiple managers to their Google+ pages. This means the burden of updating a brand’s page doesn’t fall on the shoulders of a single individual. Further, page managers can see an aggregate view of how many users are interacting with the business page. Google’s business-focused improvements also follow similar changes at Facebook and Twitter. Twitter also launched its own brand page enhancements, allowing businesses to pin content to the top of their brand page streams, and giving managers more creative control over the layout of the pages themselves.